The RX 480 may be sitting at the top of AMD’s Polaris family, but it was clear from the beginning it wouldn’t be the only card. The RX 470 and RX 460 were announced shortly after the RX 480’s release, though their targeting was vague, to say the least. Now we know — the RX 480 is for 1440p resolution, the RX 470 is for 1080p, and the RX 460 targets “eSports performance” – which means less demanding titles like League of Legends and Counter Strike: Global Offensive. The RX 480 starts at $200, which is already cheaper than Nvidia’s entry-level GTX 1060, which is $250. And the new RX 470 is even more budget-friendly, starting at $179, or $20 less than the RX 480. That puts it right in line with the GTX 950 and 960, and within spitting distance of the Editor’s Choice award-winning RX 480. It’s a crowded marketplace, and the RX 470 hasn’t claimed a piece of it yet. Will cost-cutting help expand the Polaris offerings, or is $20 too slim to notice? 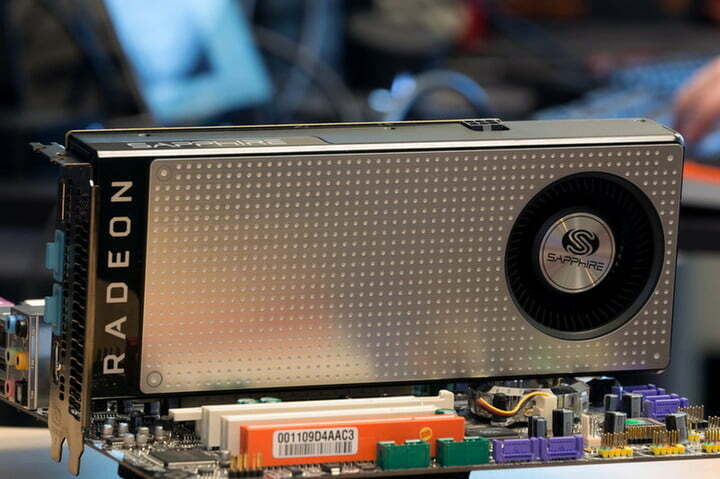 We went in-depth on AMD’s new architecture with the release of the first card built on top of it, the Radeon RX 480. It brings with it a slew of new features as well as a different manufacturing process that uses 3D transistors instead of the planar type found on most previous chips. If you’re interested in learning more about Polaris, our RX 480 review, as well as our breakdown of the platform’s features and improvements, would be a great place to start. At the heart of the RX 470 you’ll find 2,048 Stream Processors clocked at 926MHz base, and 1,206MHz boost – at least in the stock version. Our review unit was a Sapphire OC card built on the reference design, with a slightly elevated 1,216MHz boost clock. The more powerful RX 480 boasts 2,304 Stream Processors with a 1,120MHz base clock, for comparison. Like the base RX 480, the RX 470 is loaded with 4GB of GDDR5 memory. Its 211GBps bandwidth is once again just shy of the RX 480’s 224GBps. GDDR5X and HBM are starting to show up in high-end cards, but haven’t yet trickled down to the budget end of the spectrum. 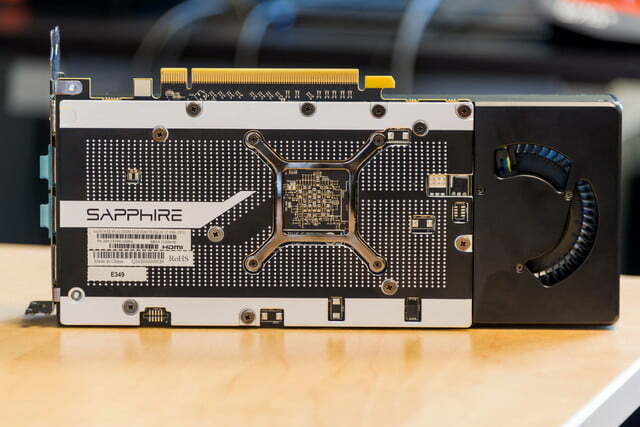 There’s also an 8GB version of the RX 480 – in fact, that’s the model we reviewed. There’s an 8GB version of the RX 470 as well, but we’re not sure picking one up is a wise move. Even with the RX 480, the extra RAM makes very little difference – certainly not enough to justify the leap in price. The end result is a claimed 4.9 teraflops of peak compute power, which is over twice the GTX 960. That’s not a huge surprise, considering both Nvidia and AMD have been trying to make the move to the next die shrink for some time. Cards from both sides boast massive on-paper performance and efficiency gains over their predecessors. The RX 470 packs in the feature set you’d expect from a new video card. 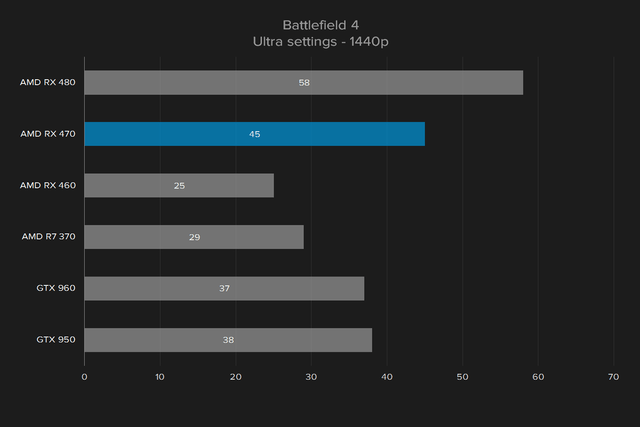 That means AMD’s multi-monitor Eyefinity, Crossfire, and DirectX 12 multi-GPU support. 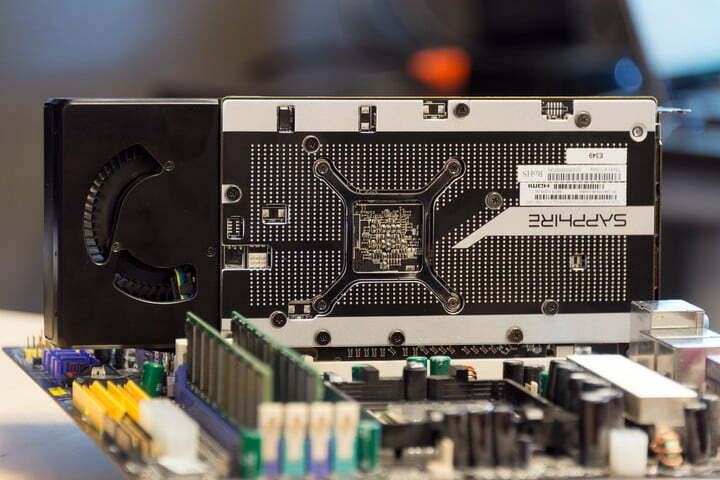 The latter has become a point of pride for AMD, as its cards have proven to offer faster perform than Nvidia’s in the recent past. We’ll be sure to test that in our review. Unfortunately, the RX 470 doesn’t claim support for VR headsets. The Oculus Rift has stringent lines for what card is or isn’t compatible, but SteamVR is a little more open to sub-par hardware. We ran a quick SteamVR performance test, and the RX 470 scored right at the top of the capable section, but fell just short of VR ready. 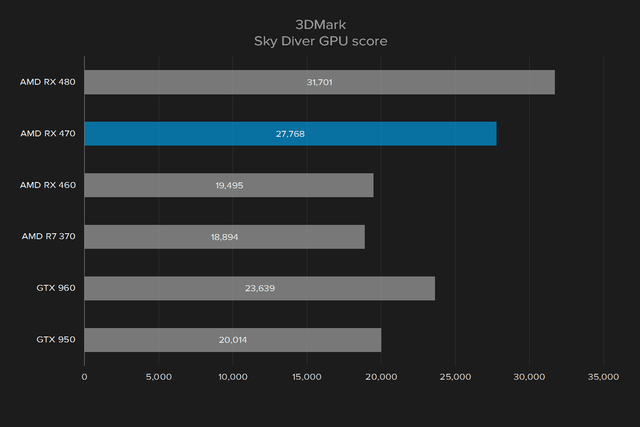 That doesn’t mean it won’t run VR applications, but it does mean its level of performance is a bit below what’s recommended for smooth VR gaming. It may still work with games that have adjustable settings, and it’s worth noting that the benchmark stayed over 90 frames per second the whole time. Still, if you already have or plan on buying a VR headset, the Radeon RX 480 is the better choice. We fired up our X99 test system to benchmark the cards. It’s a bit overkill, with an Intel Core i7-6950X, 8GB of RAM, and an Intel 750 Series SSD. The good news is that nothing in the system will bottleneck the cards, so they’ll be working to their full potential. We also have a decent selection of comparative results from other cards, which were tested in this same system. The RX 470 falls behind the more mature RX 480 by 13.4 percent on average in the 3DMark synthetic DirectX 11 tests. That’s not a huge difference, but slightly more than the ten percent price difference separating the RX 470 and RX 480, which improves the latter’s value. 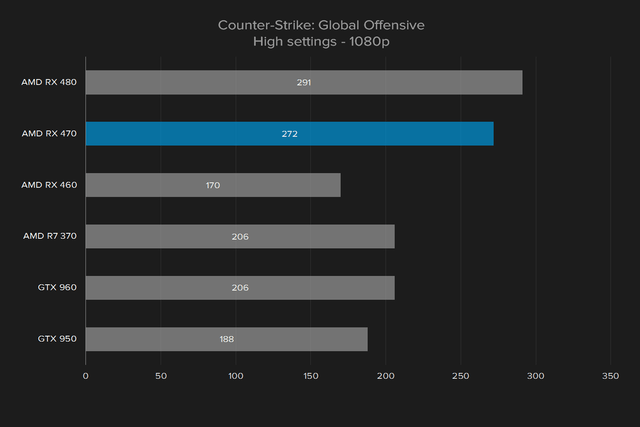 The RX 470 opens up a fifteen percent lead over the GTX 960 in these same tests. That’s great, as the GTX 960 tends to hover around $200. 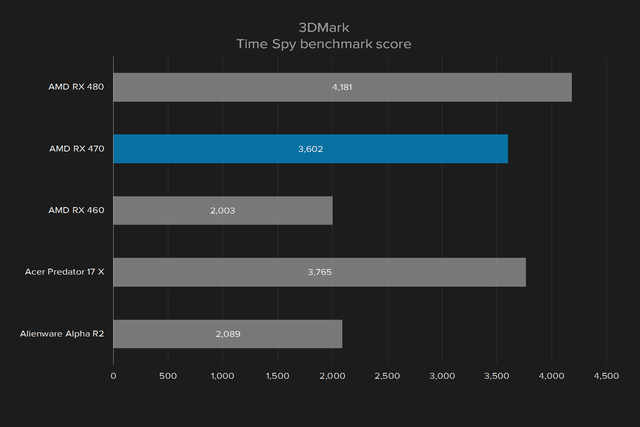 3DMark’s latest test, Time Spy, is built to test the capabilities of DirectX 12, and cards optimized for it. It’s a new benchmark, so we only have limited benchmark data for it. 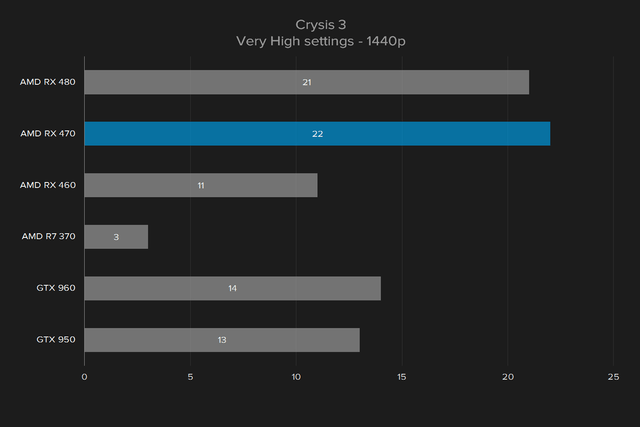 But it’s worth noting that the RX 470 almost ties the Acer Predator 17 X, a gaming laptop with a desktop GTX 980 inside. AMD’s new cards have shown impressive DirectX 12 performance so far, and this is no exception. 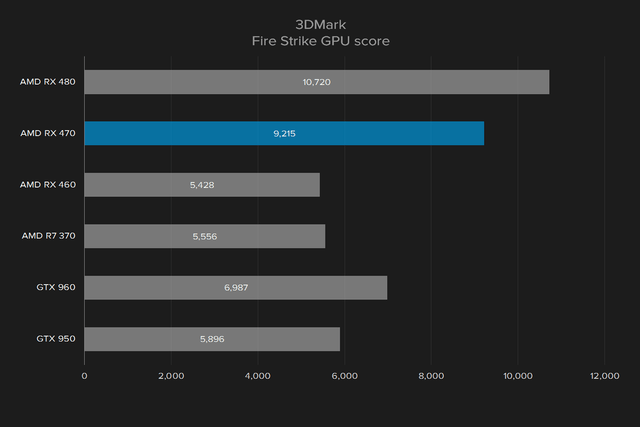 Now that the boring stuff is out of the way, we can dig into real gaming benchmarks. We ran our tests on the same X99 system, and we ran the same tests with the Radeon RX 480, Radeon RX 460, Radeon R7 370, the Nvidia GeForce GTX 950, and the GeForce GTX 960. True to AMD’s word, the RX 470 is more than adequately equipped for 1080p gaming of almost any sort. 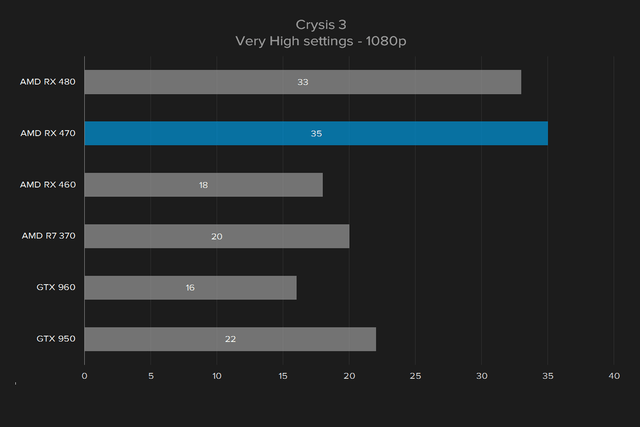 It only drops below the target 60 frames per second at ultra in Crysis 3, with all the settings cranked up to the maximum. Though it’s an old game, Crysis 3 at maximum detail remains a GPU-killer. The other good news is that, in some games, the RX 470 has breathing room. It hits 86 frames per second at ultra in Fallout 4, which is good news for gamers making the move to higher refresh rate displays. This also means the RX 470 won’t immediately go out of date. Both cards fly past Nvidia offerings at the price point, as well, although the GTX 960 breaks 60 frames per second in Fallout 4. It’s certainly more readily available than the RX 470 will be for some time. If you want 1440p gaming, the RX 480 is the Radeon of choice. But the RX 470 holds up alright at that higher resolution. 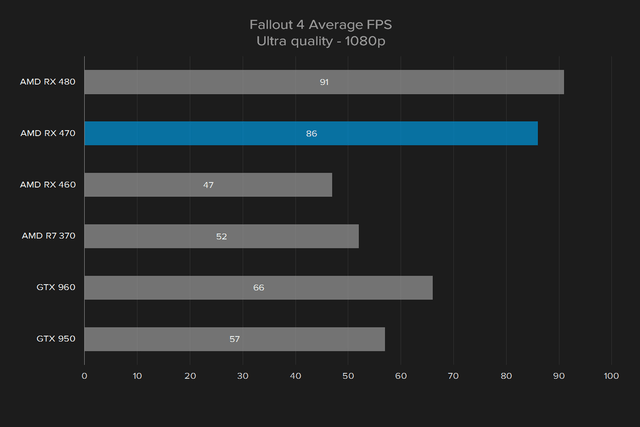 It hits 58 FPS in Fallout 4 on ultra, and 45 FPS in Battlefield 4, while both the GTX 950 and 960 struggle to keep up as the pixel count rises. The RX 480 takes a slightly stronger lead at 2,560 x 1,440 than it does at 1,920 x 1,080, which makes that $20 bump a lot more appealing if you think there might be a new, higher-resolution display in your future. We didn’t test any of these cards at 4K. They’re clearly not capable of it. If you want to play 4K, you need to be aiming for a Nvidia GeForce GTX 1070 at the least, and may even need a mutli-GPU configuration. AMD’s Crimson management software has been improving constantly since it was introduced in 2015. The reworking didn’t go unnoticed, and in our minds, it’s a more intuitive and attractive experience than Nvidia’s GeForce Experience and Control Panel, which are still two separate and awkward pieces of software. The RX 470 delivers on the promise of smooth 1080p gaming. For a full breakdown of the improved feature set on the new Radeon generation’s software, swing on over to the RX 480 review, where we’ve gone more in-depth on Wattman, the overclocking and power management tool that’s designed with enthusiasts in mind. While a lot of power users will still reach for MSI Afterburner, the AMD suite can actually provide real performance boosts to a lot of casual gamers, and Nvidia can’t claim the same of its first-party software support. Warranty will vary based on manufacturer, but it’s worth noting that the warranty on our Sapphire card won’t cover the installation of third party coolers. If you plan on going open-loop, this isn’t the one to pick up. 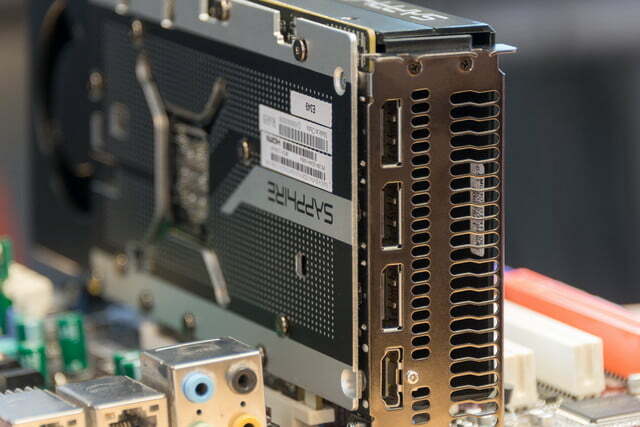 AMD’s latest generation confirms that there’s little reason to put a GTX 950 or 960 into a newly built rig. At $200 or less, you have a lot of options, and the RX 470 ensures that at least two AMD cards beat out Nvidia’s previous generation. 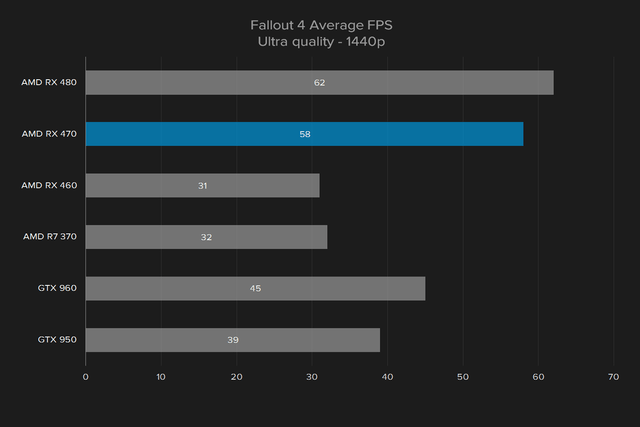 The RX 470 delivers on its promise of smooth 1080p gaming, and even slightly exceeds it in popular titles like Fallout 4. 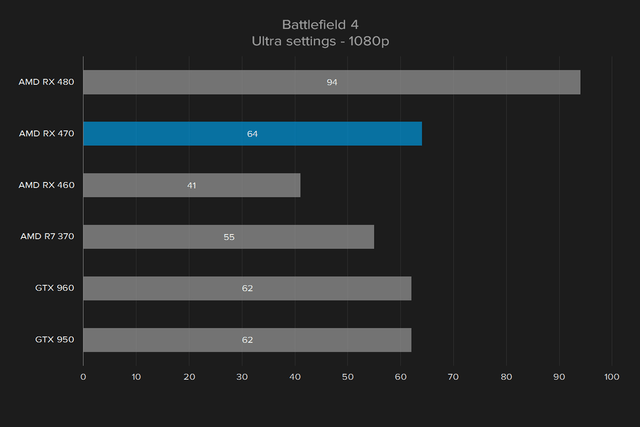 If you game at 1080p, this is all the card you’ll need – for a couple years, at least. With that said, we’re not sure we’d take the RX 470 over the more powerful RX 480. At 1080p, the difference between the two is slim, just over four percent. At 1440p, the difference goes up to about six percent. That difference is lower than the ten percent difference in suggested retail, but that’s not the only factor at play here. The biggest advantage is VR. While the RX 470 might work, the RX 480 is certified for use with both SteamVR and the Oculus Rift. It also takes a much stronger 13.4 percent lead in synthetic tests, which would lead us to believe there’s a bit more power to be harnessed down the road, particularly as more DirectX 12 games start popping up. And, given the small difference between the RX 470 and RX 480 in price — $180 vs. $200 – we find it hard to wrap our brains around going for the cheaper option. The money saved isn’t even enough to buy most new PC games, so why not purchase the faster card? But that doesn’t take away from what the RX 470 accomplishes. It does exactly what AMD said it would. It also smears Nvidia’s current, low-end cards. Nvidia’s decision to price the GeForce GTX 1060 at $250 puts it way out of reach for buyers who might be considering a $180 to $200 video card. 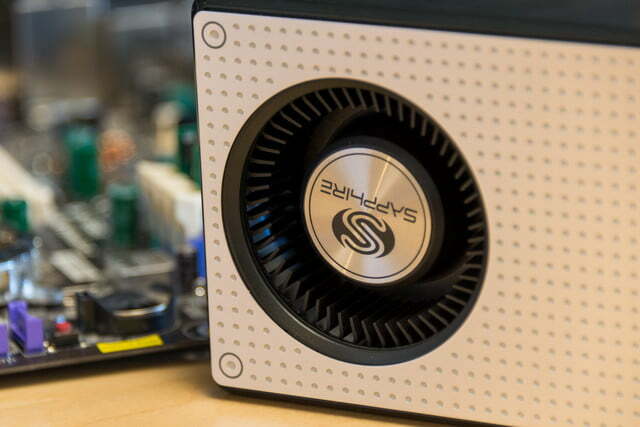 AMD’s new Radeons are the only sensible choice for gamers on a budget.